Should I choose Cloud Hosting or Geolocated hosting or CDN to serve customers in different geographies? ◉ What is the purpose of geolocated hosting? ◉ What should I choose if my client expects customers from multiple locations? If you’ve had at least one of these questions in mind, keep reading. Why Should I think twice about Cloud Hosting for website visitors from various locations? The common belief when it comes to serving customers from different locations is that Cloud Hosting, which boasts of high performance and turbo speed is probably a better option than geolocated hosting which in comparison, may not have the superior performance of the Cloud. It is true that greatest advantage of the Cloud is amazing flexibility which makes it ideal for businesses with growing and fluctuating demands. Cloud easily gives you an advantage over competitors due to the sheer superiority of this type of hosting. But does this mean it’s the ideal hosting choice to serve visitors from locations around the globe? Well, I’m here to tell you that that might not be the case. What’s important to understand is that while the Cloud certainly is superior, local Cloud hosting still has servers in physical locations which, if aren’t close to your customers’ location, can affect the load speed time of your website. Surprised? If performance is your objective, Cloud hosting (which is definitely powerful and offers flexibility) would be an ideal choice. However, if low latency and high speed are important to you, geo-located servers are apt in this situation due to the sheer proximity of the server to the customer, which the Cloud might compromise on. It’s important to assess your objective. Would you prefer the power of a Cloud server or the low latency from a geo-located server? Enter, CDN. 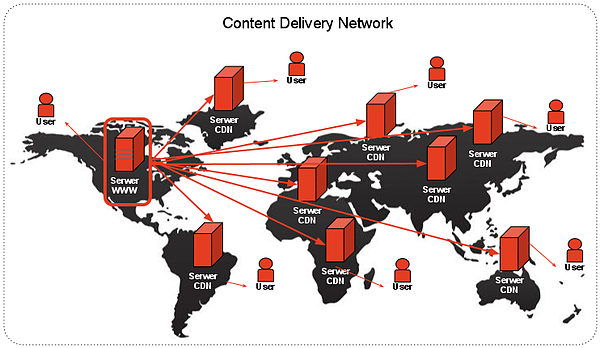 CDN is short for content delivery network. It’s a system of distributed servers that deliver pages and content to users in different locations. It servers your webpage content from the closest edge-server to your visitor. Some examples of popular CDNs are Amazon’s CloudFront, CloudFlare, Akamai. How does CDN improve speed? CND stores copes of the files on your webpage in various locations around the world. When someone visits your website, these files are delivered to them from the closest CND server. What are the advantages of CDN? Usually, web providers have servers in locations around the world to enable faster load speed and lower latency. 1. Proximity to market i.e. the distance data has to travel between your server and the user which affects load speed also known as latency. The closer the proximity, the greater the load speed. Geolocated hosting facilitates that. Try assessing your needs with the 80:20 ratio – where serving a majority of your clients’ customers is important to you. 2. Search Engine Optimisation Benefit: Server location is one of the many factors Google considers when delivering a webpage to check if your website is relevant for that geography or language. Google says, “The server location is often physically near your users and can be a signal about your site’s intended audience” therefore increasing your chances to be visible to the target audience in their searches. 3. 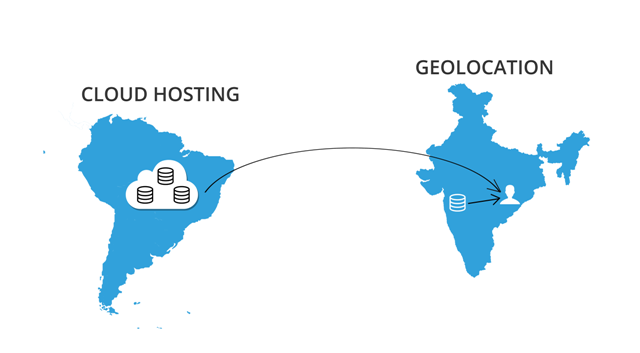 Cost effective: Geolocated hosting is certainly more affordable than Cloud Hosting and CDN. If your business does not see very high volumes of traffic, this might just be the best budget solution. It’s economically better if you’re looking to cover more of your target audience.